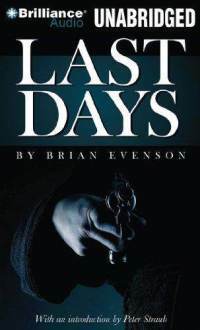 Here is everything you need to know about Last Days: This short novel is brilliant enough live up to the eleven-page fawning introduction penned by Peter Straub—though, fair warning, the Ghost Story author festoons his effusions with so many delicious twists and snatches of plot you’d be crazy to read it before diving into the tale beyond. Of course, if that’s not enough to pique your interest, we can toss in a dismemberment-obsessed cult that makes the axe-wielding psychos Sly Stallone tangled with in Cobra look like extras in a particularly feisty episode of Toddlers & Tiaras, a jaded one-handed cop through whose eyes we experience the faction’s absurd depravities, and a narrative that somehow balances pitch-black satire against harrowing blood-and-guts corporeal believability. Still on the fence? Didn’t think so. Much like Jonathan Lethem’s literary fraternal twins Motherless Brooklyn and Gun, with Occasional Music, Last Days mashes noir archetypes atop bizarro contrivances to summon forth a fantastical world only a degree or two off from our own, then sets the beguiling creation barreling off down the rabbit hole, improbably managing to up the stakes over and over again, right up until the last line of the disquieting finale. Evenson—an incontestably superior talent since his opening 2002 salvo, Altmann’s Tongue—herein further establishes himself as a writer utterly allergic to the (too) well-defined boundaries of horror fiction, and, consequently, raises the genre up in his clenched jaw and carries it forward, a literary feline nimbly prowling toward fresher killing fields.